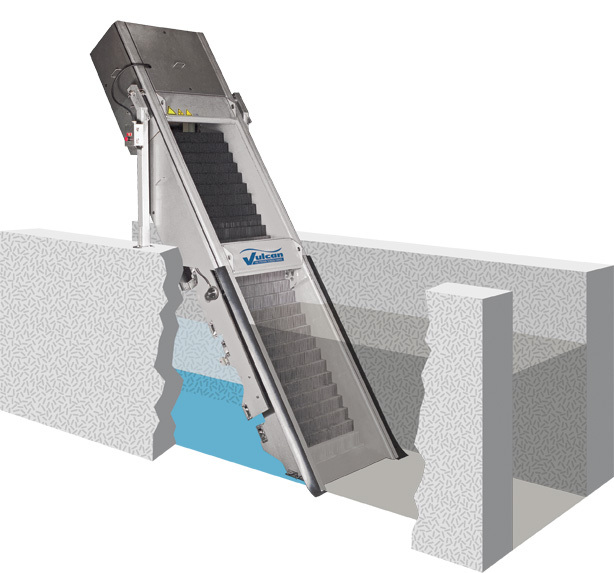 The Model ESR Stair Screen is an automatic, self cleaning, fine screen for primary, secondary or sludge screening in municipal and industrial sewage treatment installations as well as industrial applications such as slaughterhouses, tanneries, breweries, and paper plants. Its design allows for easy installation in new and existing facilities without channel modification, and with a maximum setting angle of 57 degrees, the Model ESR Stair Screen has a compact overall footprint. Formed stainless steel plate side frames, thickness of 0.24 in. (6mm). Stainless steel lamellas (wastewater screening elements) in the screening area. Stainless steel or corrosion-resistant, UV-stabilized synthetic material lamellas in the transport area, depending on overall height of screen. Drive system consisting of gear reducer, motor and dual chain transmission system with automatic chain tensioning devices. 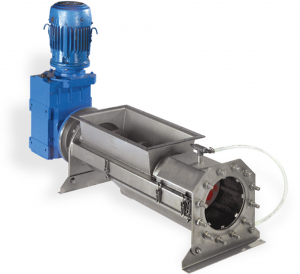 To prevent corrosion, the drive system is located above the maximum water level, and the gear reducer and motor are encapsulated away from the corrosive atmosphere of the channel. All moving parts of the drive system are protected by removable enclosure panels. Screen enclosures above the channel equipped with removable panels for safe operation and odor reduction. The Model ESR Stair Screen operates on a system of alternating fixed and movable stair-shaped screening elements, or lamellas, that extend over the entire screening surface. The nominal space between the screening elements is variable between 1mm and 6mm. Typical sizes include 6mm and 3mm openings. Please contact Vulcan if a different bar spacing is required. Debris from the flow stream collects on the wastewater screening surface to form a mat. This mat acts as a filter to remove particles that would otherwise pass between the lamellas. 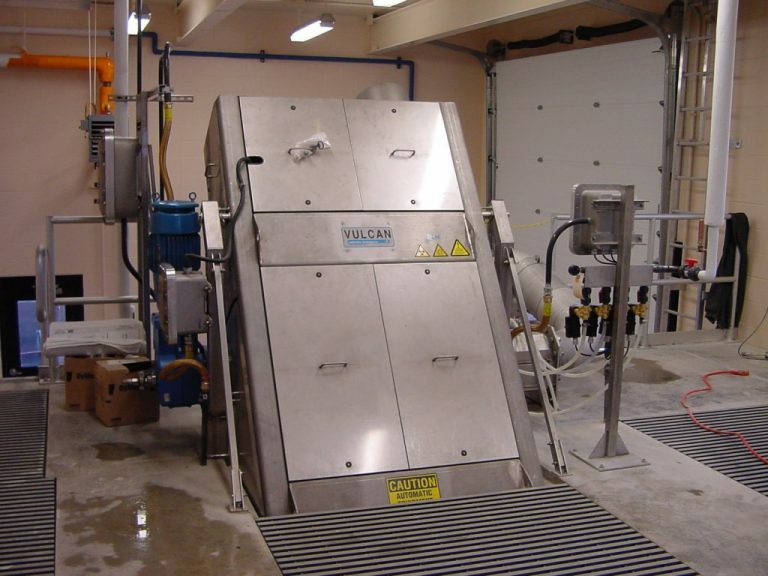 Typically a thick wastewater screenings mat can be formed due to the low headloss characteristics of this type of stair screen. When the differential or high level reaches a predetermined level, the movable lamellas are activated. The movable lamellas rotate upward, lifting the debris to the next highest level of fixed lamellas, and then rotate back to their original position. The drive system provides a positive mechanical action throughout the complete rotation of the movable lamellas. This enables the unit to drive through any debris that may accumulate under the wastewater screening surface. The lamellas move the debris from the screening area in the channel to a transport area above the operating floor. The intermittent and slow progress from channel to discharge allows the debris to shed excess water while suspended on the fixed lamellas. Once the debris reaches the top step it is discharged to a conveyor, post-screening device or suitable container. The rotation of the movable lamellas mechanically forces debris off of the screen at the point of discharge without the need for brushes or spray systems. 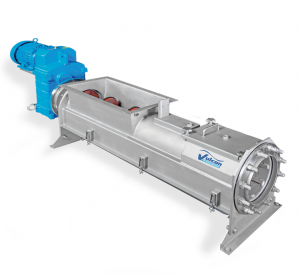 In addition to primary screening devices, we offer a wide variety of post-screening and dewatering devices. The Model EWP Washing Press and Model ESP Screw Press provide dewatering and transport for collected screenings. Connect multiple screening devices to a single dewatering and compacting device with one of our conveyor or sluicing troughs. Let’s get started.